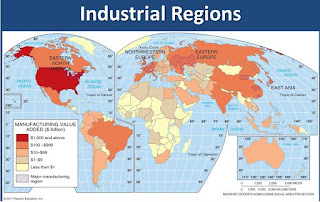 Major Industrial Regions of World: Major Industrial Regions of World is one of Subtopic under Geography of World and India which is one of main 11 Topics in RAS Pre Examination as per RAS Exam New Pattern from 2013, RAS 2016 and so on. www.rasexam.com will cover Notes on all topics of RAS Pre, Mains for RAS and other competitive examinations. 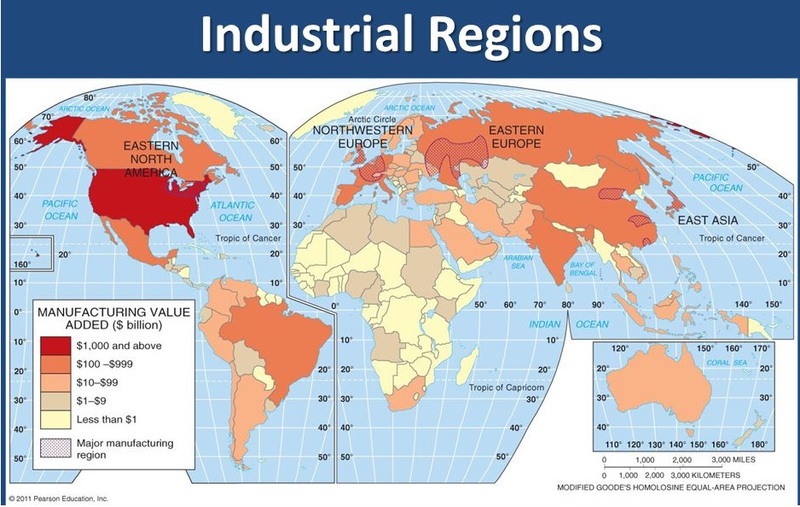 Geographic Distribution Major concentrations of modern manufacturing have flourished in a few number of places. These cover less than 10 per cent of the world’s land area. These nations have become the centres of economic and political power. The existence of a market for manufactured goods is the most important factor in the location of industries. Access to Market: The developed regions of Europe, North America, Japan and Australia provide large global markets as the purchasing power of the people is very high. Access to Raw Material: Raw material used by industries should be cheap and easy to transport. Industries based on cheap, bulky and weight-losing material (ores) are located close to the sources of raw material such as steel, sugar, and cement industries. Access to Labour Supply: Labour supply is an important factor in the location of industries. Access to Sources of Energy: Industries which use more power are located close to the source of the energy supply such as the aluminium industry. Access to Transportation and Communication Facilities: Speedy and efficient transport facilities to carry raw materials to the factory and to move finished goods to the market are essential for the development of industries. The cost of transport plays an important role in the location of industrial units. Government Policy: Governments adopt ‘regional policies’ to promote ‘balanced’ economic development and hence set up industries in particular areas. Industries based on Size: The amount of capital invested, number of workers employed and volume of production determine the size of industry. Accordingly, industries may be classified into household or cottage, small-scale and large-scale. Industries based on Inputs/Raw Materials: On the basis of the raw materials used, the industries are classified as: (a) agro-based; (b) mineral based; (c) chemical based; (d) forest based: and (e) animal based. Basic Industry: You have seen some machines and tools made of iron or steel. The raw material for such machines and tools is iron and steel. Which is itself an industry. Consumer Goods: The consumer goods industries produced goods which are consumed by consumers directly. For example, industries producing breads and biscuits, tea, soaps and toiletries, paper for writing, televisions, etc. 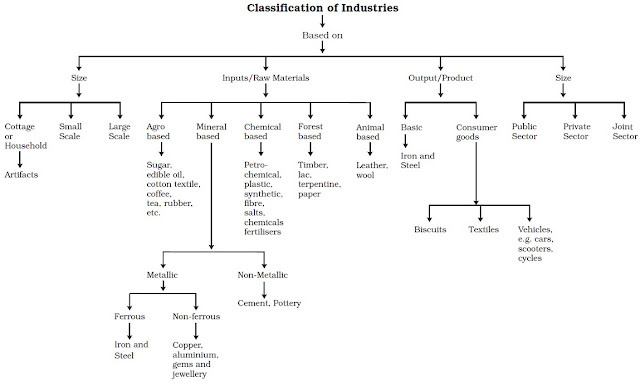 are consumer goods or non-basic industries. Public Sector Industries are owned and managed by governments. In India, there were a number of Public Sector Undertakings (PSUs) like ONGC, NTPC, SAIL, Coal India etc. Socialist countries have many state owned industries. Mixed economies have both Public and Private sector enterprises. Private Sector Industries are owned by individual investors. These are managed by private organisations. In capitalist countries, industries are generally owned privately. Joint Sector Industries are managed by joint stock companies or sometimes the private and public sectors together establish and manage the industries. Ruhr Coal-field, Germany: This has been one of the major industrial regions of Europe for a long time. Coal and iron and steel formed the basis of the economy, but as the demand for coal declined, the industry started shrinking. The Ruhr region is responsible for 80 per cent of Germany’s total steel production. Iron and Steel industry forms the base of all other industries. In U.S.A, most of the production comes from the north Appalachian region (Pittsburgh), Great Lake region (Chicago-Gary, Erie, Cleveland, Lorain, Buffalo and Duluth) and the Atlantic Coast (Sparrows Point and Morisville). Pittsburg area is now losing ground. It has now become the “rust bowl” of U.S.A. The important steel centres are Birmingham and Sheffield in the U.K.; Duisburg, Dortmund, Dusseldorf and Essen in Germany; Le Creusot and St. Ettienne in France; and Moscow, St. Petersburgh, Lipetsk, Tula, in Russia and Krivoi Rog, and Donetsk in Ukraine. In Asia, the important centres include Nagasaki and Tokyo-Yokohama in Japan; Shanghai, Tienstin and Wuhan in China. Jamshedpur, Kulti-Burnpur, Durgapur, Rourkela, Bhilai, Bokaro, Salem, Visakhapatnam and Bhadravati in India. Cotton textile industry has three sub-sectors i.e. handloom, powerloom and mill sectors. Cotton textile manufacturing requires good quality cotton as raw material. India, China, U.S.A, Pakistan, Uzbekistan, Egypt produce more than half of the world’s raw cotton. High technology, or simply high-tech, is the latest generation of manufacturing activities. It is best understood as the application of intensive research and development (R and D) efforts leading to the manufacture of products of an advanced scientific and engineering character. High-tech industries which are regionally concentrated, self-sustained and highly specialised are called technopolies. The Silicon Valley near San Francisco and Silicon Forest near Seattle are examples of technopolies. Industrial region of USA & Canada comprise of The New England Regions, The New York - Mid-Atlantic Region, North - Eastern Region. The Southern Region, Western Region & Pacific Region. Industrial regions of Canada are Ontario & St. Lawrence Valley, Prairie Region & pacific coastal region. It includes cities of Quebec, Toronto, Hamilton, Vancouver, etc. Industrial regions of united kingdom are Lancashire, London's basin, Scotland, Midland, South-Wales, etc. producing manufacturing products like engineering, ferrous, chemical textile, food & beverages, etc. Industrial regions of Germany are The Saar Region, The Hamburg Region, Berlin Region & Leipzig Region with iron & steel heavy chemicals, textiles & different consumer goods Industries. Industrial region of France produces iron & steel, textile, glass, leather, automobiles with Northern, Lorraine & Paris Industrial Regions. Other European countries like Italy, Switzerland, Holland Belgium, Sweden, etc. along with Russia are industrial giants. Industrial regions of China are the most dominant industrial power of Asia with industrial agglomerations in Manchurian region, Yangtze region, North-china region, South China region, etc. with many manufacturing units producing steel, heavy chemical's textiles, paper, cement, automobiles, toys, etc. Industrial region of Japan has several industrial cities producing steel’s Pedro-chemical, cement, footwear. toys, etc. at Tokya-Yokohama region, Osaka - Kobe region, north Kyushu region. Industrial regions of India are The Calcutta Conurbation, The Mumbai-Pune Industrial belt, Ahemadabad - Vadodara belt, Southern industrial regions with Chennai, Coimbatore, Bangalore industrial belt, Damodar Valley industrial belt, Northern Capital regions (NCR) with centers like Delhi, Noida, Gaziabad, Gurgaon, Manesar, Biwani etc. Montreal: Montreal's aerospace sector, Canada is comprised of more than 210 companies which employ 43,500. This city is the world's 4th largest center of aerospace manufacturing. It's the only area in the world where an entire aircraft be assembled from locally manufactured components. Singapore: More than 30 biomedical sciences companies have established regional headquarters in the country. This sector contributes 4%-5% of the country's GDP. Part of the attraction of this industry to the country is its IP protection which has been ranked the second best in the world. Taiwan: Taiwan's domestic optoelectronics industry is fifth of the world’s largest producers of TFT-flat screens are Taiwan-based. The sector manufactures high-precision, high-definition and color displays. Mexico: Electronics manufacturing activity in Mexico is widespread. Guadalajara’s capital city, Jalisco, is regarded as the epicenter of this industrial sector. In the last 15 years, approximately $14 billion in investments have been made to make production stronger and more efficient. Shenzen, China: Shenzen, which is located between Guangzhou and Hong Kong, is a large manufacturing center that has sprung up quickly. Incorporating the success of its neighbors, it is ranked fourth in China for industrial output. It has been manufacturing higher technology products than Guangzhou in general, with several of its own successful companies. Barcelona: Barcelona has served as a crossroads of manufacturing -- a vital center of trading and shipping -- throughout the millennium now coming to a close. Its strategic location, on the Mediterranean Sea and near the border with France, has made its emergence as the principal industrial and commercial center of Spain inevitable. Chicago: More than 80 years ago, when steelworkers and meat packers defined the spirit of Chicago, Carl Sandburg pronounced it the "City of the big shoulders." Today, when blue suits capture that spirit as well as blue collars, the name sticks. Chicago Metropolitan Area, is home to 29 Fortune 500 companies and is a transportation and distribution center. Manufacturing, printing, publishing, insurance and food processing also play major roles in the city's economy. Detroit: Detroit is second largest source of architectural and engineering job opportunities in the U.S. Detroit is known as the automobile capital of the world, with the domestic auto industry primarily headquartered in Metro Detroit. Houston: The story of Houston is the story of a lesson painfully but profitably learned. When oil prices collapsed in 1982, the city suffered. But as the community reeled, it also pledged it would do everything in its power to find a cure. Today, in addition to its strength in oil and gas exploration, basic petroleum refining, and petrochemical production, the area thrives on high technology, medical research, health care, and professional services. The economy of Houston is primarily based on the energy industry (particularly oil), however, health care, biomedical research, and aerospace also constitute large sectors of the city's economy. Osaka: Osaka has the greatest number of manufacturing establishments in Japan with more than 18000 companies. It is an area where the artisan spirit lives on, with more than 60% of industrial production taking place in small and medium-sized enterprises. Randstad: The Randstad region of the Netherlands is a cornucopia of manufacturers engaged in everything from tobacco to information technology. But it is not merely the products that emerge from this thriving region that give it its world-class status. The Randstad earns its place by virtue of its holistic approach to manufacturing. Its impressive lineup of headquarters, logistics, and R&D facilities puts the region on the manufacturing map, and marks it with a gold star. San Jose: The capital of Silicon Valley, San Jose is considered to be the birthplace of the high-technology boom and the semiconductor industry. The spirit of innovation emanating from Silicon Valley remains the energy force that fuels high technology around the globe. São Paulo: The city now is the commercial center not only of Brazil, but also of South America. Besides its prominence in the chemical, textile, metalworking, and electronics industries, São Paulo is a driving force in world automobile production. No wonder the São Paulo metro area continues to attract all sorts of plants, including automotive. Seoul: The relationship between Seoul and Inchon stands as a model of the world-class manufacturing community. No one city can achieve world-class status alone. The bustling port city of Inchon is used to its best advantage by Seoul, whose own manufacturing base -- primarily textiles and apparel, chemicals and medicine, electrical products and electronics, and machinery -- supplies markets around the world. It comes as no surprise, then, that Seoul is at the forefront of the globalization of Korea. Shanghai: One of the largest cities in the world, Shanghai earns its world-class distinction by virtue of its position as the leading commercial and industrial center of China and for capitalizing on its strategic location with outstanding transportation links. Like São Paulo, Shanghai benefits greatly from its perception in the executive suites of foreign corporations. Tokyo: Tokyo, capital of the Kanto region and counterpart of Osaka in the Kansai region, is home to many of the world's largest manufacturers as well as thousands of smaller firms. Tokyo also is a headquarters community, with automakers among those who have found it an ideal setting for both corporate penthouses and plant floors. Toronto: Although Toronto serves as headquarters for a number of manufacturing firms, it is the North American auto industry that keeps it thriving. And when the cars and trucks roll off Toronto's assembly lines, many of them head straight to the U.S. A cosmopolitan city where culture and business walk hand in hand, Toronto is poised to be a symbol of the best of the best in Canada as a new century dawns.